downtown, is the HACIENDA DEL SOL, a resort like place in a beautiful tropical setting with fully furnished Palapas, Cabanas and Bungalows in different sizes. Here is also the Casa Coromuel, one of the loveliest accommodation as vacation rental for the whole family or a few friends. Very comfortable 130 sqm = 1.500 sqft with two bedrooms, outfitted with twin beds or King Size beds and excellent orthopedic mattresses. The kitchen has beside a lot of electric appliances a 4 burner stove with oven and big fridge / freezer. Enjoy a Margarita on the spacious, tiled terrace in company of a few hundred years old giant cactus or have your breakfast in the morning sun. Jump in the swimming pool right beside the house or walk 100 yd to the beach. The protected water has no big waves and undertow, the fishing is good and if you like clams, just pick them up and steam them for dinner. We are not allowed to list our web site here, so please contact us for more information. or if your spam filter is set to high, you have to look in your spam / trash folder for our response to your inquiry. We answer EVERY mail and if you don't get any respond from us, please check your spam folder or give us a call. You will find the phone number on top of this page and don't worry, we speak your language!! We get at least one call per week from angry guests who inquired and are mad that we did not answer. PLEEEEEASE !!!! CHECK YOUR SPAM FOLDER !!!! We answer to EVERY mail even if we have no vacancy!! All bungalows are in a tropical setup with cacti, palm trees and tropical flowers. A paradise for the Ornithologist with all the birds. 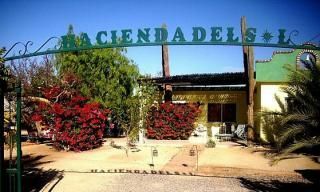 Our Hacienda del Sol is in a small, quiet community. we have two different beaches, divided by a beautiful Mangrve forest where all the seabirds nesting. Complete Kitchen with big Fridge/freezer, Microwave, Toaster, Coffeemaker, different small electric appliances, 4 burner stove with oven, all stainless steel pots and pans, silverware and plates. Smoking only outside and no cigarette buts on the ground. Near by amenities as tennis, gym, cinemas (and what a beautiful big one it is with the newest releases from hollywood in original language with spanish subtitles), theater, art exhibitions, galeries, museums, fine dining, shopping and everything a big city has to offer. Walk the Malecon ( sea promenade ) in the evening, see all the artists performing, sit in an outside restaurant and let the world pass by when you enjoy a fantastic meal. It really is beautiful here!! And when you have enough from the hustle and bustle of the big city, in a few minutes you are back at our little tropical paradise for a quiet night rest in non polluted air. We love to tell our guests where to go and waht to see and here is soooooo much to do. Weekly Rate: $490.00 Perfect for a few friends or a Family of 4+. Just $ 490 +tx USD for a whole week. Since we are non profit, this rate is valid all year round. No extra charge for prime season. The price is pro rated. If you stay longer than a week, we divide the price by 7 days and then multiply it by the actual days you are here. Long term rental for more than one month is available with a special discount.